NETWORK FINALS: CBS’s NFL PLAYOFFS game adjusted to 9.4. 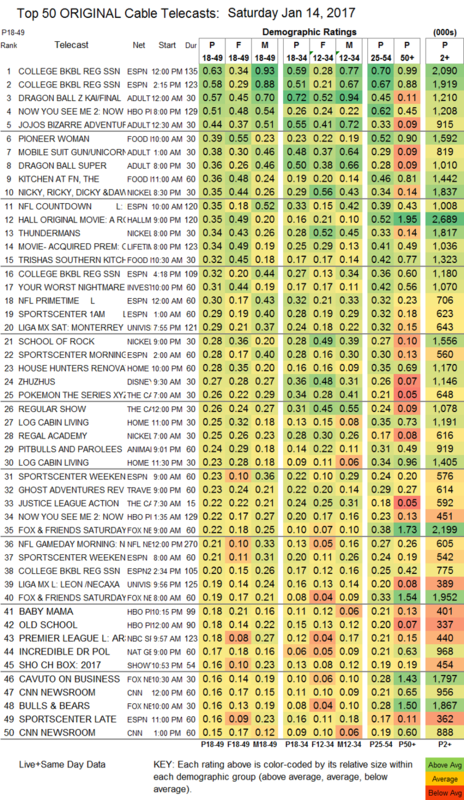 Elsewhere, the rerun of LETHAL WEAPON was adjusted to reflect the afternoon NFL overrun, and fell 0.4 to 1.2. CABLE HIGHLIGHTS: ESPN’s COLLEGE BASKETBALL coverage had the Top 2 slots on Saturday cable, with Duke vs. Louisville at 0.63, and Florida State vs. UNC at 0.58. Adult Swim’s late-night animation block was as follows: DRAGON BALL SUPER down 0.07 to 0.58/1.236M, DRAGON BALL Z up 0.05 to 0.57, JOJO’S BIZARRE ADVENTURE steady at 0.44, MOBILE SUIT GUNDAM up 0.03 to 0.38, HUNTER X HUNTER up 0.02 to 0.32/685K, NARUTO up 0.02 to 0.32/634K, ONE PIECE up 0.04 to 0.30/584K, and ONE PUNCH MAN up 0.05 to 0.32/614K. 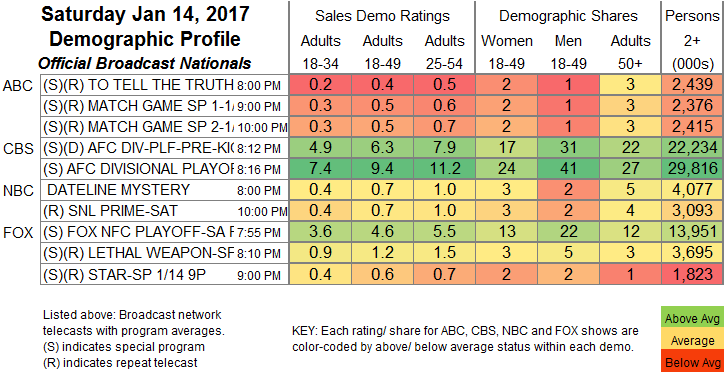 Food Network’s PIONEER WOMAN rose 0.02 to 0.39, KITCHEN AT FN was up 0.03 to 0.36, and TRISHA’S SOUTHERN KITCHEN ticked down to 0.32. Nickelodeon’s NICKY, RICKY, DICKY & DAWN hit the Top 10, up 0.06 to 0.35, with lead-in THUNDERMANS steady at 0.34, and lead-out SCHOOL OF ROCK up 0.08 to 0.28. Hallmark’s movie A ROYAL WINTER was at 0.35. HGTV’s HOUSE HUNTERS RENOVATION fell 0.04 to 0.28.